Faberge style egg ornaments derive from the famous Russian Faberge eggs. Faberge eggs get their name from Gustav Faberge, a Russian jeweler of the 1800s. When his son Peter Carl joined him in business, they began to attract the attention of the czars. It became a tradition of the Russian czars to give the splendid Faberge eggs to their wives or mothers. The eggs were quite ornate, decorated with jewels and they opened up to reveal a hidden surprise inside. The first Faberge egg contained a yolk which held a golden hen, which held a tiny crown and a tiny ruby egg. It was a gift to Czarina Maria in 1885. While you might not have an authentic Faberge egg ornament for your tree you may certainly have one of these beautiful approximations. These beautifully decorated Faberge type eggs will look lovely on your tree at Christmas time, or they can be displayed year round on an ornament stand. They’re a throwback to the time of Russian royalty when the men would give lavish gifts to their ladies. At least one of these will open so you can hide a special little gift inside. Maybe a piece of jewelry inside would be a great idea for your special someone at Christmas. You can hang the Faberge type eggs on tree or you can get a display stand for them. You can buy stands like the one shown below that displays a single egg or you can get one that displays up to 18 eggs. A small Christmas tree such as one of these would be perfect for displaying a collection of Faberge Style Egg Ornaments. 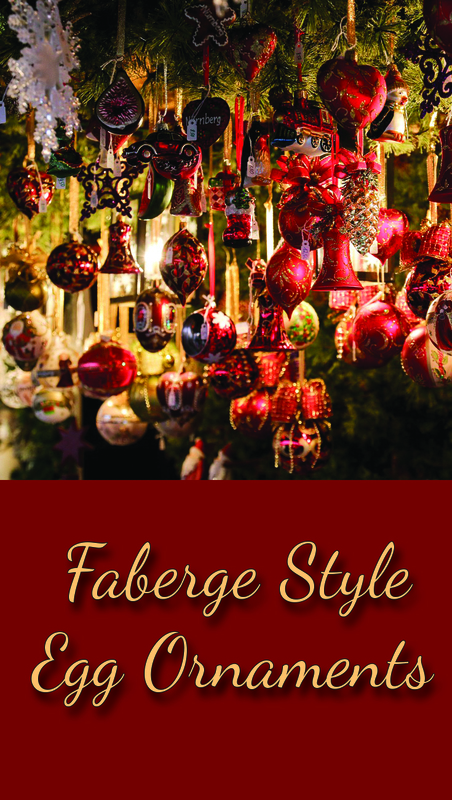 Faberge style egg ornaments make wonderful special gifts for Christmas.